What’s your drink of choice? Is it a small pumpkin spice latte? Then you’re lots of fun and a bit sassy. Or a medium americano? You prefer simplicity in life. Or perhaps it’s a small decaf soy sugar-free hazelnut caffe latte? Some might call you a yuppie. Seventeen-year-old barista Jane Turner has this theory that you can tell a lot about a person by their regular coffee drink. 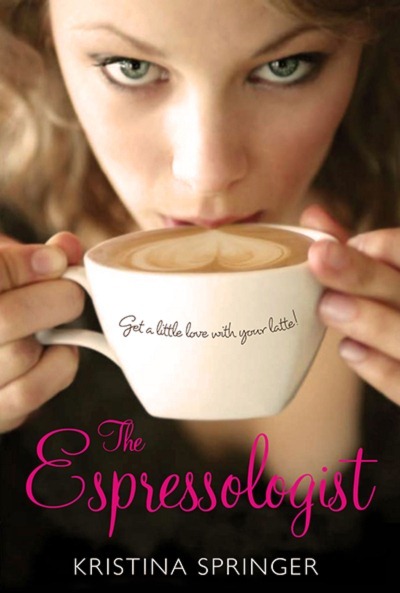 She scribbles it all down in a notebook and calls it Espressology. So it’s not a totally crazy idea when Jane starts hooking up some of her friends based on their coffee orders. Like her best friend, Em, a medium hot chocolate, and Cam, a toffee nut latte. But when her boss, Derek, gets wind of Jane’s Espressology, he makes it an in-store holiday promotion, promising customers their perfect matches for the price of their favorite coffee. Things are going better than Derek could ever have hoped, so why is Jane so freaked out? Does it have anything to do with Em dating Cam? She’s the one who set them up! She should be happy for them, right? What a cute little story! Jane, who works at a Starbucks-esque cafe, is bored one day and decides to start writing down her observations of what customers are like based on the kinds of drinks they order. Out of the blue, she gets the idea that maybe certain types of people (based on their drink orders) would be perfect matches for other people, and starts playing cupid with her customers. In an interesting turn of events, suddenly Jane is matchmaking by the hundreds, while doing her best to juggle school, her own crushes, and her best friend’s unexpected happiness over a new boyfriend. The premise is simple, the plot predictable, and the characters not as entirely well-rounded as one might find in a longer contemporary YA. But that doesn’t make it any less sweet, fun, or delightful to read. You can see the twists coming a mile away, but because this is a simple romantic comedy of sorts, we know exactly who to root for, and exactly who needs their comeuppance–and it’s still worth it when it happens! It’s certainly an HEA type of story, but one that provides plenty of smiles and "feel-good" moments along the way. A quick read, but worth it. Kristina Springer is the author of THE ESPRESSOLOGIST, MY FAKE BOYFRIEND IS BETTER THAN YOURS, and the forthcoming JUST YOUR AVERAGE PRINCESS (fall 2011). She has a Masters in Writing from DePaul University and she resides in a suburb of Chicago with her husband and children. This entry was posted on Thursday, April 5th, 2012 at 1:30 am	and is filed under Tasty Tomes. You can follow any responses to this entry through the RSS 2.0 feed. Both comments and pings are currently closed. That story sounds really cute. The description put me in mind of Jane Austen’s Emma. Sounds like a nice, light, holiday read – I’ll add it to my list. Thank goodness for ‘Good Reads’!